St Ewe Free Range Eggs make Pasteurised Liquid Egg Award Winning; being announced as a Great Taste Winner. This is the first time that any Liquid Egg brand has won the acclaimed Great Taste Award. Up until now it has been a product that has been about function. St Ewe are putting this convenience product into a new category – championing quality and taste. Giving chefs and manufactures a high end quality product. A far cry from the fipronil scares felt by the European egg market a year ago. Great Taste, the world’s most coveted food awards, celebrates the very best in food and drink. Out of over 12,600 products to be judged, St Ewe Free Range Eggs, based in Cornwall was awarded a 1-star Great Taste award, which means judges dubbed it a food that delivers fantastic flavour for the Liquid Egg Range (Whole, Yolk & White). St Ewe Free Range Eggs, took a leap of faith in 2017 by installing their own Pasteuriser on the home farm in Cornwall. However the risk has clearly paid off as a year later, as they now have Great Taste Awards and Gold Taste of the West Awards for the Liquid Egg product range. As well as starring in a BBC documentary; The Farmer’s Country Showdown that follows their journey launching the Liquid Egg products at Speciality Fine Food Fair 2017 (to be aired again on 3rd August 2018). 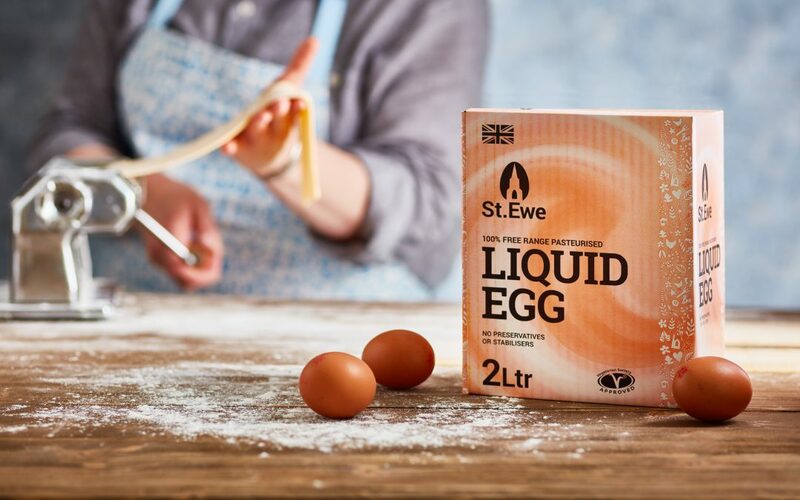 St Ewe, known for their signature egg yolks, now offer this same vibrancy and quality in the liquid egg. Which is available as Liquid Egg White, Liquid Whole Egg and Liquid Egg Yolk. Already being used by many restaurants and manufactures, notably Michelin starred chef; Chris Eden at The Driftwood and new start up Keto brand Hunter & Gather in their avocado oil mayonnaise.